100 years: It’s been that long since Vancouver won its one and only Stanley Cup in 1915, when the Vancouver Millionaires of the Pacific Coast Hockey Association crushed the Ottawa Senators of the National Hockey Association in three straight games in their best-of-five series. But even that isn’t the longest Stanley Cup drought for a current NHL city. Winnipeg hasn’t won the big prize since 1902 – 113 years ago! – when the Victorias defeated the Toronto Wellingtons in January that year, before losing a challenge to the Montreal Hockey Club (aka the Montreal AAA) that March. They may be extreme long shots even to get out of the first round now, but at least the Jets and Canucks gave themselves a chance to end their cities’ Cup droughts this year. So did Ottawa, with an amazing 23-4-4 finish to clinch a playoff spot on the final day of the regular season … although it’s looking pretty unlikely that Senators will bring the Stanley Cup back to the Canadian capital for the first time in 88 years dating back to 1927. 75 years: When the New York Rangers won the Stanley Cup in 1940, it marked their third championship in what was then the 14-year history of the franchise. It would be 54 years before they won it again in 1994, setting an NHL futility streak the Leafs seem to be aiming for. The Rangers haven’t won the Cup again in the 21 years since then, which means they’ve only won it once in 75 years! (Maybe twice by June.) Hey, Leafs fans, when you think of it that way, Toronto’s won the Cup 10 times in that stretch. 40 years: They’ve come close a few times (as recently as 2010), but this year marks four decades since Philadelphia’s last Stanley Cup victory in 1975. In the grand scheme of things, how much worse is 48 years than 40? 25 years: After winning for the fifth time in a span of seven years during the team’s 11-year NHL history, it’s now been 25 years since the Edmonton Oilers won their last Stanley Cup in 1990. If you’re about my age, the Flyers drought and this one have got to make you feel old! At least fans in Edmonton will have Connor McDavid to make them feel better. 90 years: The Stanley Cup victory by the Victoria Cougars in 1925 means it’s now been that long since the last non-NHL team won the Cup. 80 years: The Stanley Cup victory by the Montreal Maroons in 1935 is the last victory by an NHL team that no longer exists. 50 years: Montreal’s seventh-game victory over Chicago on May 1, 1965, marked the first time in hockey history that the Stanley Cup Finals stretched beyond April. whole set of mini NHL trophies from the Hockey Hall of Fame. 1965 also marked, for the Canadiens, the end of a 5-year drought. Some people thought they’d never win the Cup again… 🙂 Most teenagers couldn’t even remember the last time the Habs had gone five years without winning the Stanley Cup even once. Very interesting data. It is to be hoped that Toronto can revive before the NHL’s 100th birthday, eh? 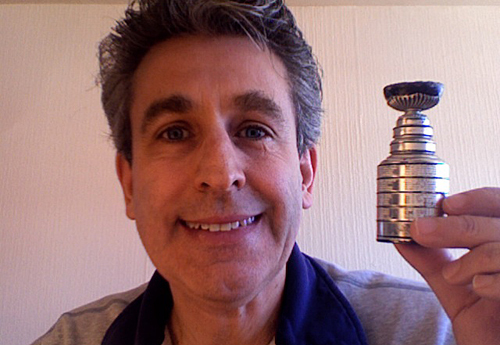 I have two or three of those mini Stanley cups…or did have. Moving to smaller quarters meant I had to give a grandson my mini trophy set that I’ve had forever. Love this story — thanks for all the into — not fun for the teams, but it sure is fun to read.